Savory wraps are a perfect accompaniment to any meal! Like a thin pancake or crepe, they’re great for dipping, wrapping, & sopping up juices on your plate – instead of bread. Gluten, grain & GMO-free. Add your favorite filling and wrap it, or just fold and dip. They’re inspired by Indian flatbread and Mexican corn tortillas, so you can eat with your hands! These are easy to make in minutes – just blend the batter and cook in an 8-inch non-stick pan. 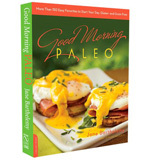 I used them for Paleo Huevos Rancheros instead of corn tortillas, and they were truly yummy! With this simple wrap, you can go crazy, add your own spices or fillings, and create a huge variety of easy meals – breakfast, lunch, or dinner. Have fun! This recipe makes 8 wraps. In any blender, add eggs, cauliflower florets, arrowroot, salt, garlic, olive oil, and water. Blend well until cauliflower is liquefied and batter is smooth. Add shredded coconut. Stir it in by hand so it remains in large pieces. The coconut adds texture and helps hold the wrap together as it cooks. Heat a few drops of oil in an 8-inch non-stick pan over medium high heat. Use a brush or a paper towel to wipe the pan between each pancake, so there's just barely a thin layer of oil in the pan. Flick a few drops of water on the pan, and when they sizzle, the pan is ready. Slowly pour 1/4 cup batter into center of the hot pan. Swirl the pan around to allow the batter to make a round shape. Cook on a medium high flame until you can just barely lift the edge with a spatula, and see that the bottom side is golden brown. Flip it over carefully. Cook briefly on the other side. Slip it out of the pan onto a plate. Repeat until all the wraps are cooked. Cover with a dry towel, or keep warm in a low temperature oven. Serve with your favorite filling, soup, salad, or main dish.